The Rajasthan government is waiving the tax on all those farmers who are not small and marginal and whose land is more than two hectares. Under the Rajasthan Crop Loan Debt Waiver Scheme, the Village Service Co-operative Society of Mehandwas was organized at the Atal Seva Kendra. In which MLA Ajit Singh Mehta distributed debt forgiveness certificates of 130.89 lakh to 667 farmers of the area. Debt of Rs.1.13 crore was waived in which 393 farmers were benefitted. You can also forgive your loan by visiting the place where camps are being set up for Rajasthan loan forgiveness scheme. It is being told that the farmers have been forgiven for the loan. Farmers will be able to breathe a lot of relief due to the debt forgiveness, farmers will not have the debt burden and farmers will also be able to do good farming. In the cooperative banks of farmers, the outstanding balance of two lakh rupees will be waived. In the loan waiver scheme 2019, there is no benefit of full-fledged farmers due to lack of Bhamashah cards linking some farmers. Whatever peasant is, quickly get the benefit of the debt waiver scheme by linking your base to Bhamashah card. Farmers have died, their family can present death certificate and take advantage of Rajasthan debt forgiveness plan. Small and marginal farmers are the most vulnerable sections of society. Therefore, the state government has decided to start the Agricultural Debt Waiver Scheme / Overdue Crop Karz Mafi Scheme, Rajasthan. Under this scheme, the entire overdue loan amount of all farmers will be exempted. Apart from this, the government will forgive the loan taken up to two lakh rupees from the farmer. Rajasthan State Government has allocated a budget of Rs. 8000 crores for successful implementation of Kisan Karz Mafi Scheme. In 2019, the government will provide Rs 384 crore as subsidy. Apart from this, the government will provide compensation of Rs. 160 crores in the form of interest. For the first time in Rajasthan, more than 29 lakh marginal, small and other farmers belonging to cooperative banks will be able to apologize for crop loan up to Rs 2 lakh. This will give farmers the benefit of debt waiver of around 8000 crore. In the last four and a half years, the farmers made record by buying 31 lakh 65 thousand metric tons of agricultural produce worth more than Rs. 10 thousand 600 crore rupees. Farmers taking new loans will also get the benefit of insurance cover of Rs 10 lakh under the Raj Sahkar Personal Accident Insurance Scheme. Come to the loan waiver camp organized in the eligible Kisan Gram Seva Sahakari Samiti and get your loan waiver certificate right there. After the farmer's original loan waiver, submit the remaining dues and get the approved loan as per the application. For information related to the camp, contact the Village Service Co-operative Society or the District Central Co-operative Bank's Branch. 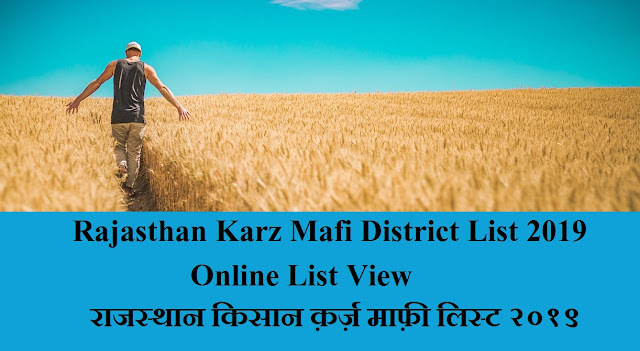 The list of Rajasthan Debt Waiver Plan 2019 has also been made available here. You can find your name there by choosing your district, District wise list will be released. The information of the beneficiary farmers of each district will be given. The link in the concerned district will be activated as soon as the list is available online. If you want to apply for online loan for farmers loan, then you can go to their website. All the farmer could take advantage of the Rs 2 lakh forgiveness plan.